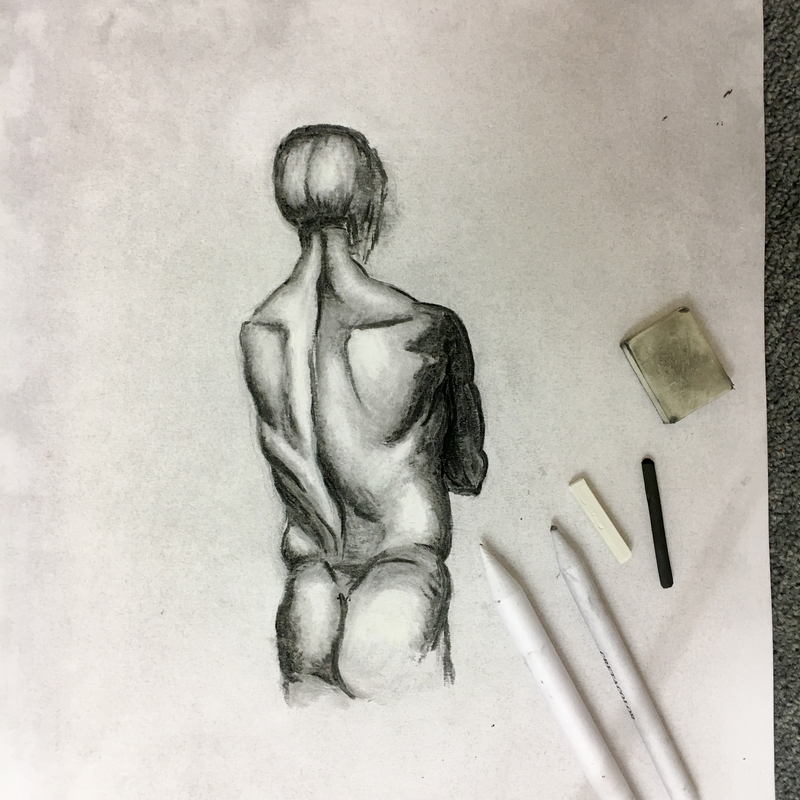 I’ve used charcoal in my life drawing sessions this week. I’ve always been dubious of this medium, being very aware that it is easily smudged and thinking capturing detail with it is difficult. However, it has actually won me over and I’ve taken away a few great notes on how switching it up from pencil can improve your drawing and develop your skills. Using charcoal forces you to work with tone more, rather than being dependant on line. Having to describe the body by light and dark masses, helps build a more realistic three-dimensional figure. Building up a figure through lines can mean that describing the body as a connected form is more easily overlooked. Having to build it up through tones forces you to explore how muscles relate to each other in the body. The contrasts that you can create with chalk and charcoal are a lot more striking and powerful compared to a pencil. There is also a greater range of shades to play with. You can quickly and easily create a mid-toned background to work on with charcoal. The opportunity to build the form by picking out the lights and darks is an excellent anatomical exercise. Charcoal and chalk can create beautifully delicate blending. Better than what I achieve I work solely with a pencil. To give you the low down on what I’ve used here. I have used medium sticks of Winsor & Newton Artist’s Willow Charcoal and a Conte a Paris, White Chalk pastel. I’ve created the mid-toned background using the charcoal on its side and blending it. To create the highlights, I have picked these out using a putty rubber first and then using the chalk pastel. The blending is created using paper tortillions for details.